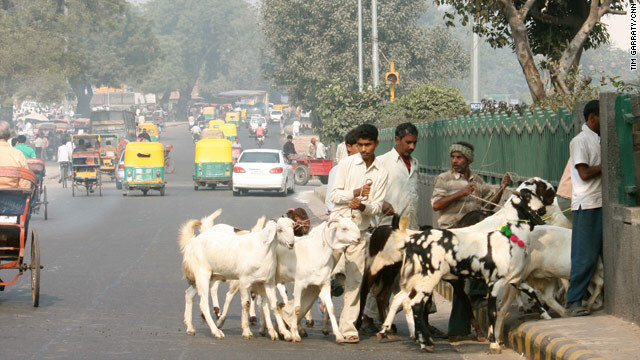 It is disgusting how Mr. Tim Garraty manages to somehow portray India as a country with 'goats everywhere'. I saw a few of his so called "visuals" of India and needless to say, it is a deliberate attempt on his part to showcase the ugly side. I am very sad to see that he is using his photojournalism skills in a very negative light. If India has goats everywhere, we see lot of debt ridden and homeless people in the US too, every country has its ugly side. Why not show the good? I checked out a number of photographs of India posted on this section of the website. Majority of them portrayed the poorer and more chaotic sides of India. None of the images reflected the growing, brighter side. This just proves how biased and lopsided the west really is about India. When reputed agencies like CNN continue to project India with such a heavily filtered lens, no wonder the citizens of US are ill-informed. Such blatant disregard and denial of truth will ultimately have negative consequences for the country and citizens of USA, who continue to live in a false sense of superiority.